Do you ever wonder where artists get their ideas? How do they find artists that influence to follow? Are new artists just stealing their ideas? After the Video . . . Hop on over to Pinterest and start pinning some epic pins that inspires you! 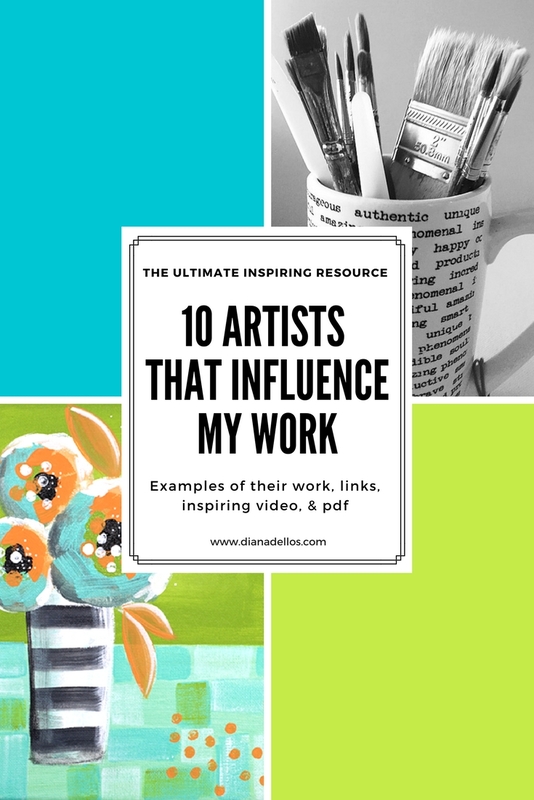 I’ll be answering the question: What artists influence your work? It kills me when I hear people say things like, “I just couldn’t think of anything to draw/paint”. What? Look down, friend, and draw you hand. Oh, you want MAJOR inspiration! Well, then we are fortunate because Google and Pinterest are your Candyland. When it comes to finding inspiring artists, new creative techniques, and tips for organizing your art supplies you only need to type away on your keyboard to find a plethora of options. So many options, in fact, that you’ll skip dinner, forget to pick up your kid, and maybe even stay up past your usual bedtime. So you can only imagine how many pins I have saved (2,910, to be exact)! I’ve been following various categories of art on Pinterest for years. I notice over and over that I’m drawn to the same artist, same styles, same colors. These are really good tips to be aware of, as a creative. It helps us narrow down our squirrel brains and hone in on the skills we really want to develop. My video and outline I put together for this post surprised me. Not because of the content. That was a no-brianer, but because of the takeaways I learned just by explaining all of this to you, my readers. I wanted to be very deliberate about why I follow these particular artists that influence me and how my art has changed because of learning more about these artists. Color and texture were two things I kept noting, but the words I used that surprised me were Brave, Bold, Trust, Adventurous, Intuitive, Listen, Authentic, & True Intentions. This tribe of influential artists that I surround myself with do more than just give me some new ideas for my artwork. They are encouraging me and in a way, giving me permission to be bolder and follow that little voice inside my heart that says Go For It! So that was my moment. I didn’t realize that. How can a story and pretty picture on my computer screen translate to me feeling more confident and empowered when I’m in my studio painting? Crazy, good stuff! “You’re only going to be as good as the people you surround yourself with. the people who are doing the really interesting work. Pay attention to what they’re talking about, what they’re doing, what they’re linking to. And Just A Reminder . . .
please share with someone that would also enjoy it!